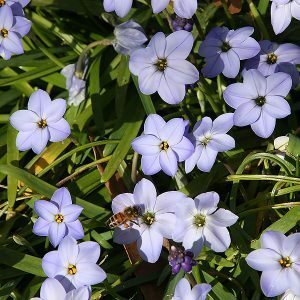 Very easy to grow, with masses of mauve flowers in spring, Ipheion uniflorum (syn. Tristagma uniform) is commonly called The Spring Star Flower. Long flowering with soft lavender blue flowers from late winter through to late spring. This is one of the best easy care bulbs to create a carpet of flowers beneath deciduous trees and shrubs. These tiny treasures grow well in any well drained soil and in full sun. They are summer dormant and will only require watering during a very dry winter and spring. Foliage begins to appear as early as late autumn, best described as strap like. These bulbs are related to Alliums, and they do multiply freely.They spread by offsets as well as underground stolens, so they will wander around the garden. For us, grow them in a container where in spring the masses of blue flowers will form a carpet over the whole container for weeks. ‘Wisley Blue’ – This is a longer flowering form than the species. ‘Rolf Fielder’ – A dwarf form, and one of the nicest varieties to grow in a container. A better blue than others in the eyes of many gardeners. Height – To 10cm for the species, around 5cm for Rolf Fielder. Spread – Will form a clump over time. Flowering period – This will depend on position and climate. Generally from late winter through spring. Availability – Generally sold in autumn.